I typically don't write all that much about national politics here, because there are so many others who do it so much better. That said, conservatives in Bleeding Kansas should take note of just how brutally the U.S. House of Representatives just stabbed pro-lifers in the back. And on the anniversary of Roe v. Wade no less. There are likely to be more than 650,000 pro life people marching in Washington today -- people of conscience who spend their own time and money defending life. I personally believe there is no greater cause than theirs. We have a Republican majority in the House (and Senate) and Americans disapprove of late-term abortions 2-to-1. I won't say much more about it, but please, if you're so inclined, head over to the Federalist and read Mollie Hemingway's column about the House's about face on a bill that would have banned most abortions after 20 weeks of pregnancy -- a point after which infants can feel pain and survive if born. Hemingway calls says the House GOP's "level of incompetence and cowardice should alarm us all." And to that, I say, "Amen." 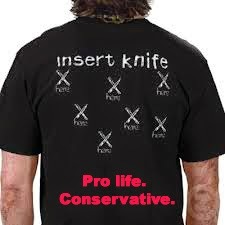 It is exhausting to wade into the public sphere, fighting for a culture of life only to have a knife in the back at virtually every turn.